I'm so excited about today's giveaway! 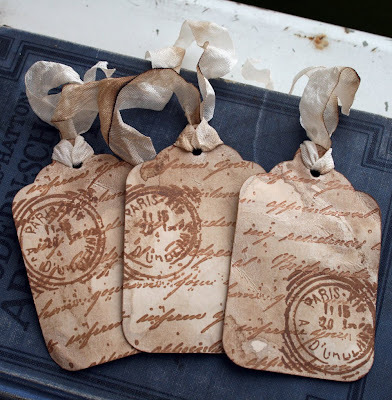 I've been anxiously awaiting the debut of Roberta's new line of tags, and you can find them at the pinkcherrymama shop! I truly cannot choose a favorite- they're all so lovely! She is giving away 4 sets of tags (each set includes 3 tags) to one lucky winner. All you need to do is visit her lovely shop and come back here to comment about your favorite sets! *And the winner is Kate! Congratulations! Come back again next Monday for another chance to win a fabulous treat from another Etsy shop! For me, the vintage inspired cherry blossoms branch are my absolute favorites! Cherry blossoms remind me of Japan, the sweet scent of Jasmine tea and late night Japenese thrillers... don't ask why! Oh wow, Spiderweb tags! And Halloween is just around the bend too! 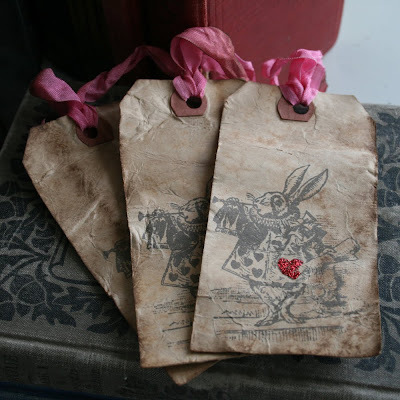 The white rabbit 'wonderland' tags are so cute. I love the little red heart. I absolutely love the bird with branches tags. I LOVE the Alice in Woderland ones, with the rabbit, so cute! The Cherry Blossoms are soo cute! The vintage cherry blossom branch and the French script tags I love, but would pick the cherry blossom branch as favourite because I grew up on a cherry farm so they are very close to my heart. Such lovely wee tags. Oh my goodness! I NEED the Cherry Blossom tags! I love them and I'm working on a cherry blossom line right now! I really like the marie antoinette tags. I think they are great. I also like the spider web ones for halloween. I LOVE the BIRD WITH BRANCHES I love birds so this is my favorite one! But they are all super cute! Love the tags and lace with the little rabbit! Gorgeous! I love the white rabbits and glittery crowns...so whimsical! Similar interests, mutual respect and strong attachment with each other are what friends share between each other. These are just the general traits of a friendship.To experience what is friendship, one must have true friends, who are indeed rare treasure. I have added you to my blogroll, hope you can do the same thing for me so that we can have constant communication. thanks for the comment on my blog (i love Frida!). *I especially love the vintage button rings..very very cool! Great shop! Jen my favourite sets are the alice in wonderland. Congrats to the winner! What a fab contest!